This section will be constantly updated, keeping you informed of any new products or new technology on the market. Led lamps, led strips-lighting and led floodlights have come a long way since being launched a few years back. The Led technology is roughly improving on scale of 30% per year. Led are now available in warm, neutral and cool white. Warm white is generally used in domestic applications, cool white for security and neutral white in commercial applications. 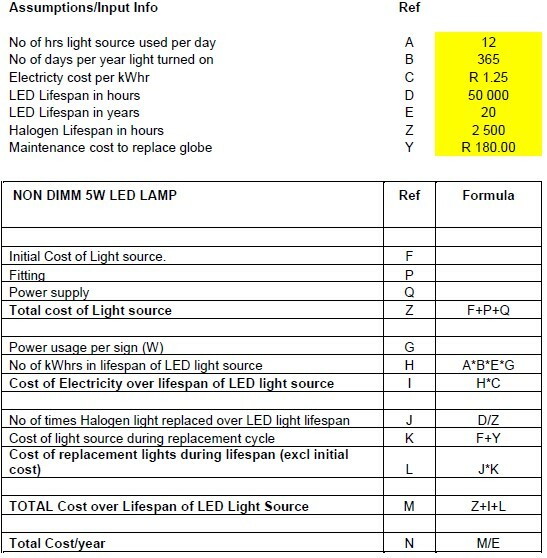 Please note that not all led lamps are dimmable, it has to say dimmable on the box, also keep in mind that the dimmers are more expensive than normal dimmers, (estimate of R 250.00 for an led dimmer). All manufacturers will recommend a dimmer that works with their products - check with the manufacturer on their specifications. It is recommended that no less than 3 led lamps should be on dimmer. 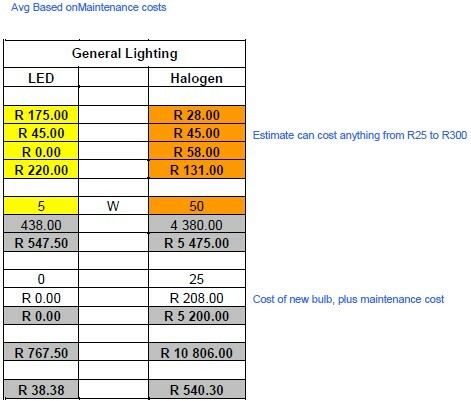 Led can be used on a low voltage circuit (12v) or on a 220v circuit – this seems to be the norm in South Africa as the Electricians hot wire to the fitting and the led control gear is in the lamp (built in). When using 12v – check what transformers are to be used. Most electronic transformers have a minium load of 20% ( 20 – 70va rated), this means that a minium load of 20w can be used for the transformer to give enough power to light up the led lamps. If one is using 3w led lamps, then 7x fitting are need on a 70va transformer to make it work. Most 12v led lamps will work directly on a wire wound transformer as this works from a very small load.